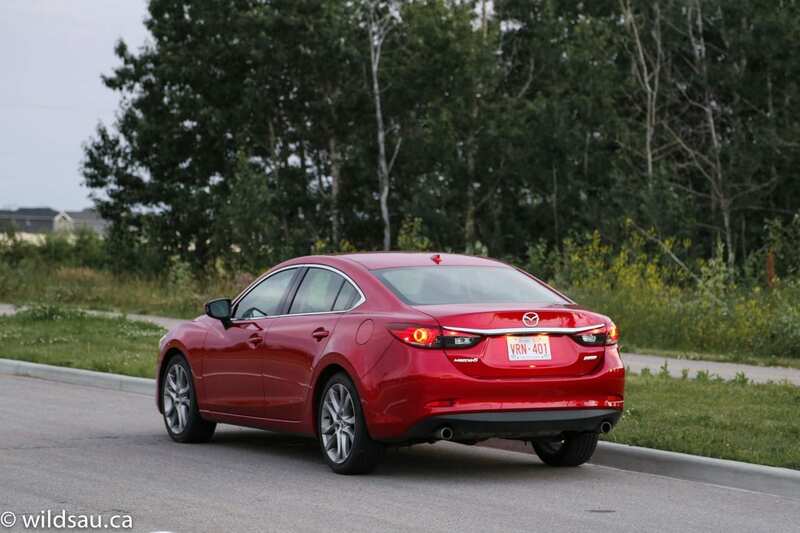 I just spent a week with the all-new 2014 Mazda6 in its top-of-the-line GT trim. Much has been said about this car, so I couldn’t wait to check it out. 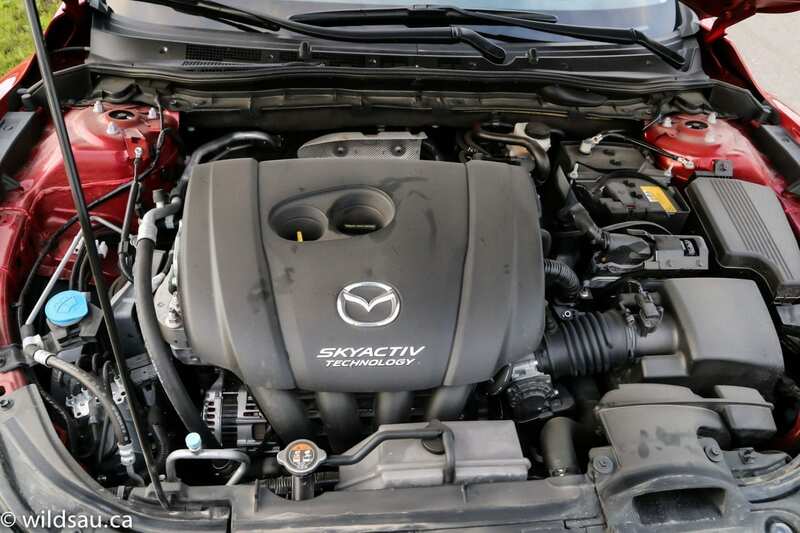 It benefits from Mazda’s Skyactiv technology, a rather nebulous concept that involves the engine, the transmission and the vehicle’s body, eking out as much performance out of the most efficient sum of all these parts. Things are lighter, work more efficiently, more smoothly and harmonize to give the driver the best balance between performance, fun and fuel efficiency. Or so they say. 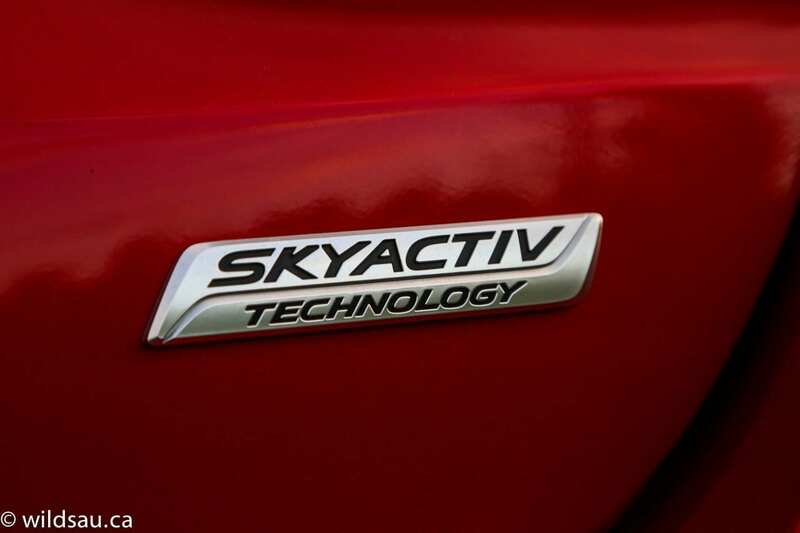 Here lurks Mazda’s 2.5-litre 4-cylinder Skyactiv engine. The numbers seem a bit paltry on paper. It puts out 184 horsepower at 5700 RPM and 185 lb.ft of torque at a relatively low 3,250 RPM. The power makes its way through a 6-speed “Sport” mode automatic transmission to the front wheels. Efficiency is constantly mentioned, and it’s pretty impressive. 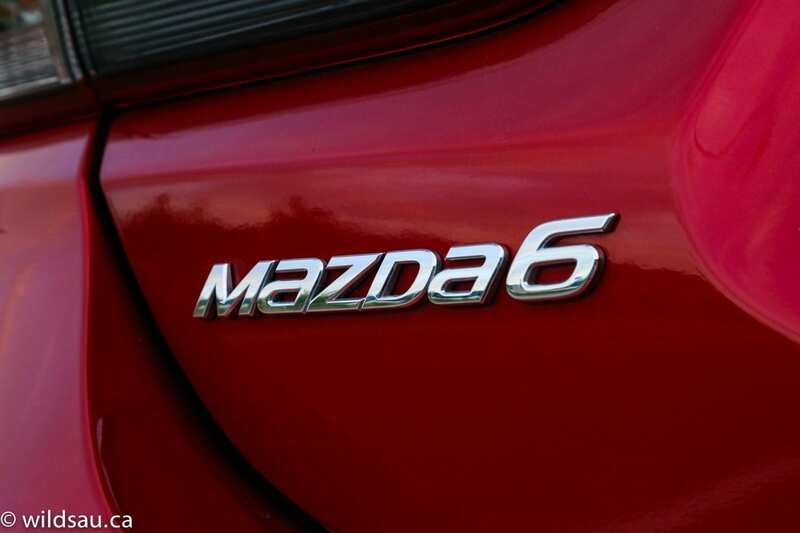 The 6 is rated at 7.6 L/100 km (31 mpg) in the city and 5.1 L/100 km (46 mpg) on the highway. I averaged an impressive 8.2 L/100 km (29 mpg) – I made no attempt to save fuel, and drove mostly in the city. The 6 did see about 75 kilometres on the highway too, which is more than usual. It has a 62 litre fuel tank and drinks regular fuel. I was pleasantly surprised to see the 6 only weighs 3231 pounds. First of all, before I start writing poems about the styling, the Soul Red Mica colour is worth the 200 bucks. It is gorgeous! 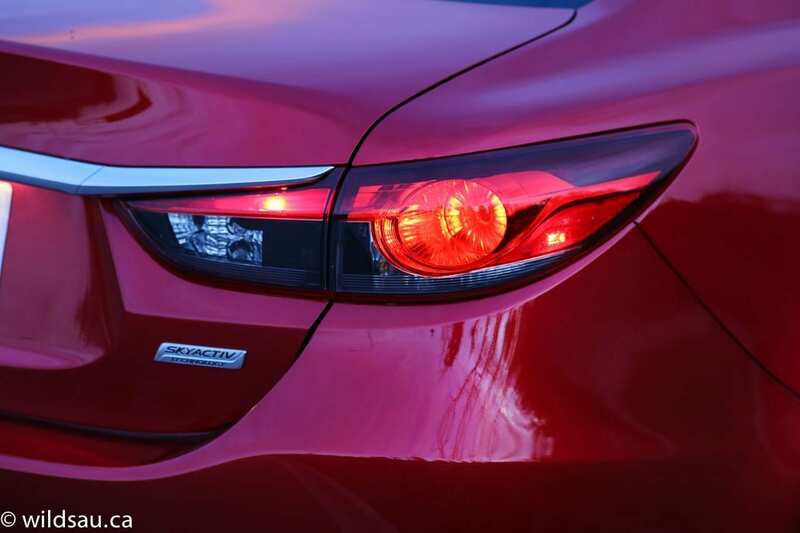 Colour aside, the sculpting you’ll find on the new 6’s exterior is fantastic. You’ll find very distinctive character lines from one end of the vehicle to the other. That’s no different than Keith Richards, you say, but this is one profile you’ll rather enjoy, unlike Mr. Richards’ character lines. 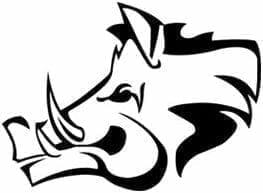 There’s an aggressive animal-like front fascia, muscular fender bulges that don’t try to hide from anybody and a flowing presence from tip to tail that really stands out. These days, there’s often little to differentiate one competitor from another, especially in this somewhat blah mid-size sedan class. 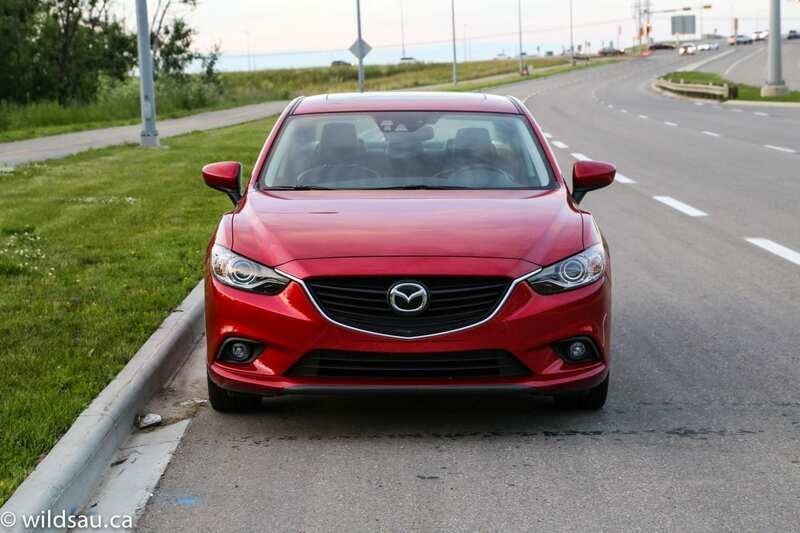 There’s no question that the Mazda6 does a great job in standing out. 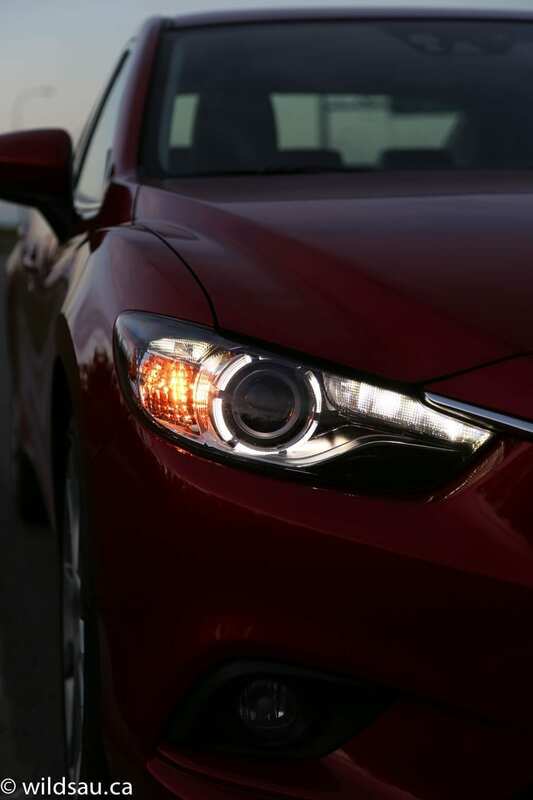 Little touches like incorporating LEDs and a halo ring into the headlights take the look even further upscale, and the 19″ rims shod with 225/45-sized boots look lovely. Much groaning was heard when Mazda debuted the TAKERI concept car. It was so beautiful and breath-taking, and the usual take on incredible concept cars is that nothing like it will ever make it to production. 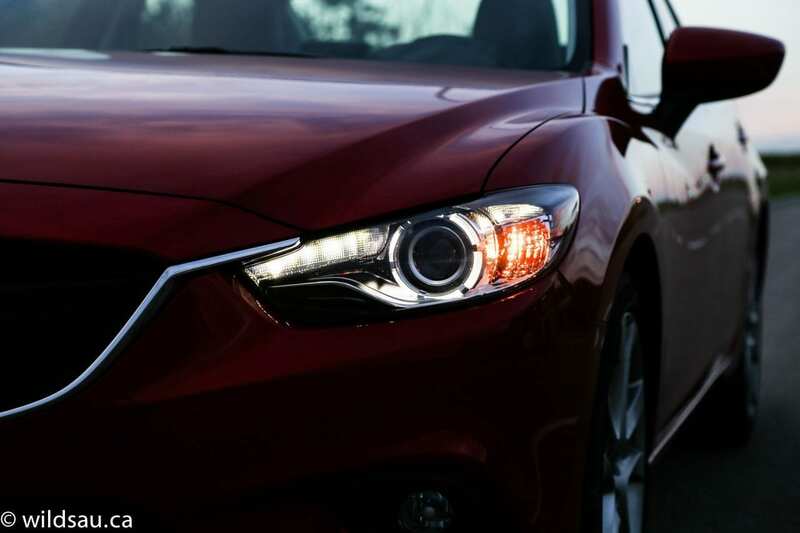 Well, Mazda, you did good. It made it almost wholly to the production 6 and that is a very good thing. 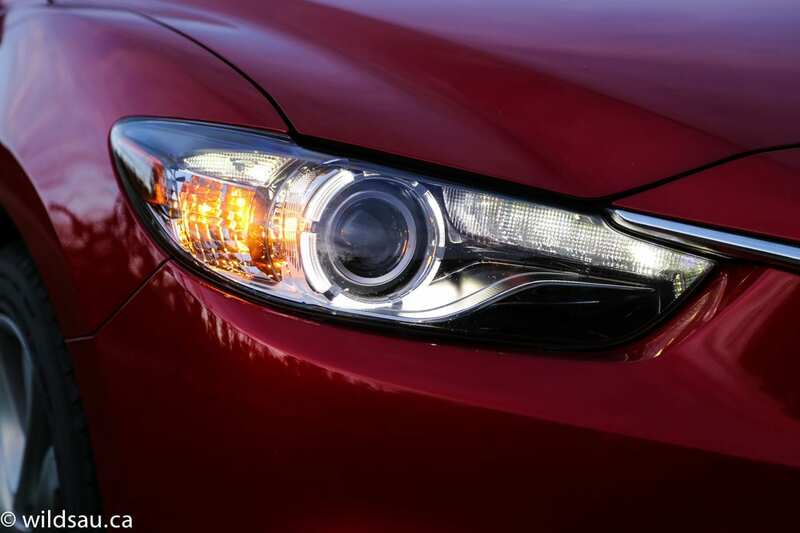 Once you get over how awesome the exterior styling is, you’ll want to get inside. The clean lines of the interior are simple and almost qualify as minimalist. It’s certainly a business-like place to be, and though it can feel a bit dark and somber, it works well. Mazda uses some nice materials here, building the dash and most of the door panels out of soft-touch plastics with nice texture. They’ve put it all together with what seems like a high level of fit and finish. It’s not a huge cabin, but it’s spacious enough. The car’s design is such that the top edge of the windshield felt awfully close to my head when I first got in – it’s not an issue, and you get used to the snugness. The overall headroom is fine for my 5’10” frame. The manually adjustable steering wheel is great to hold and has a good diameter – not too big. 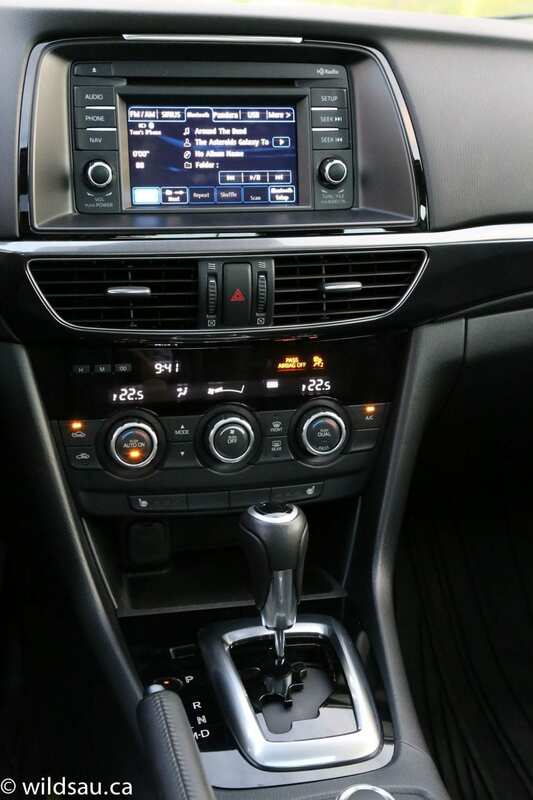 It has buttons for the cruise control, as well as the media and phone functions. 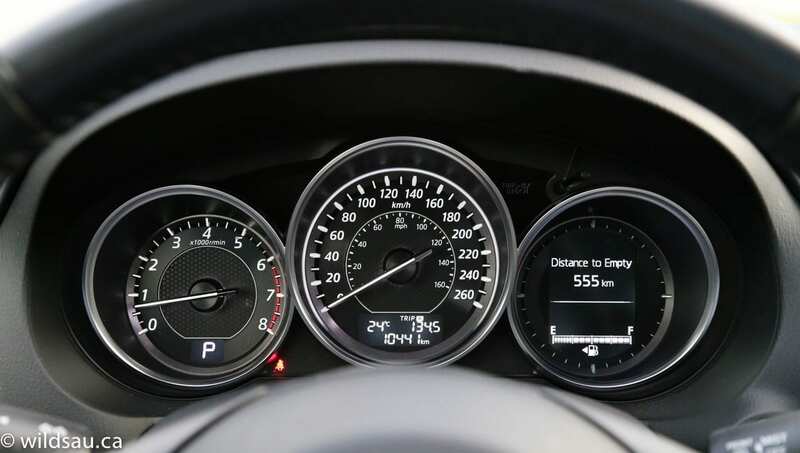 Behind it sits a relatively traditional-feeling set of clean gauges in a hooded bin – there’s a tach on left and a speedometer in the center. The right gauge isn’t a gauge at all, but rather a round driver information screen. It lets you access your fuel range, average and instant fuel economy, average speed and the vehicle settings. Though it’s effective, it’s not very nice to look at – the display feels a bit outdated with its blocky, crunchy text. 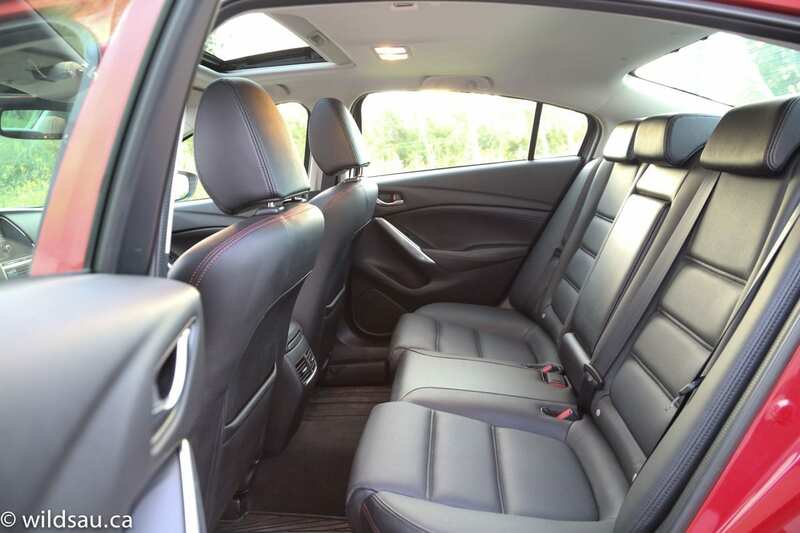 The heated, leather seats are power-adjustable and were very comfortable for me – on top of that, they come decently bolstered which is unusual in this class. There’s also a 2-position memory setting for the driver’s side. The center stack starts with a smallish 5.8-inch touchscreen at the top. Getting to it is a bit of a reach. The screen is surrounded by some hard buttons and a couple of knobs, which allow access to the major functions. Much like the driver information screen, it works well but it’s not very sharp or pretty – it feels a bit low-res by today’s standards. The screen manges your audio, navigation and phone functions. 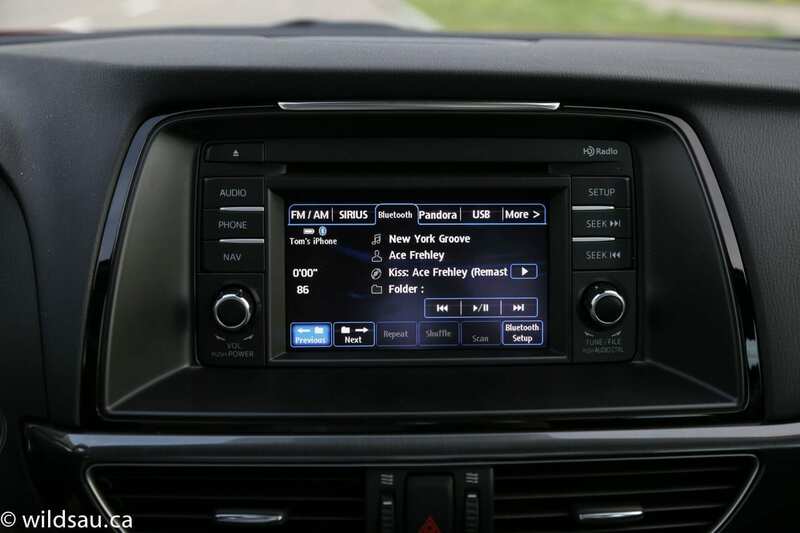 The BOSE system – which sounds quite good – plays from AM, FM, satellite radio, Bluetooth streaming, Pandora, USB, auxiliary and CD sources. Phew! 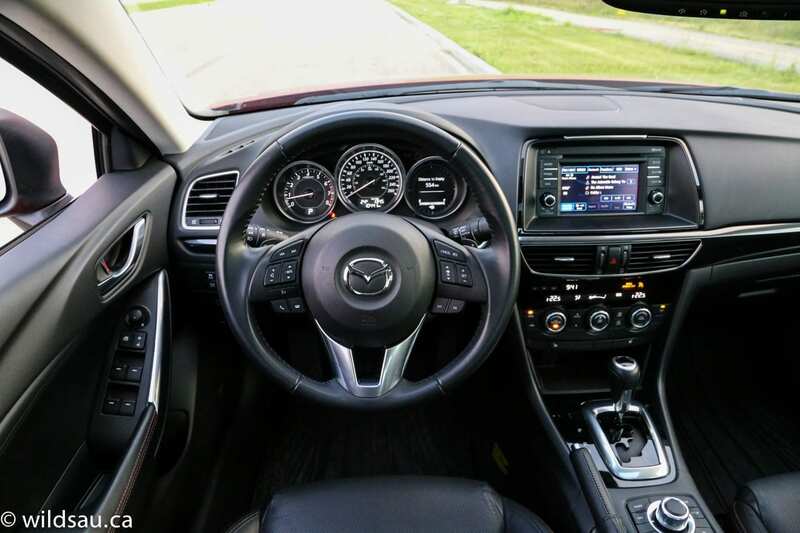 Below it sits a dual-zone automatic climate control system that is structured around three rotary dials. 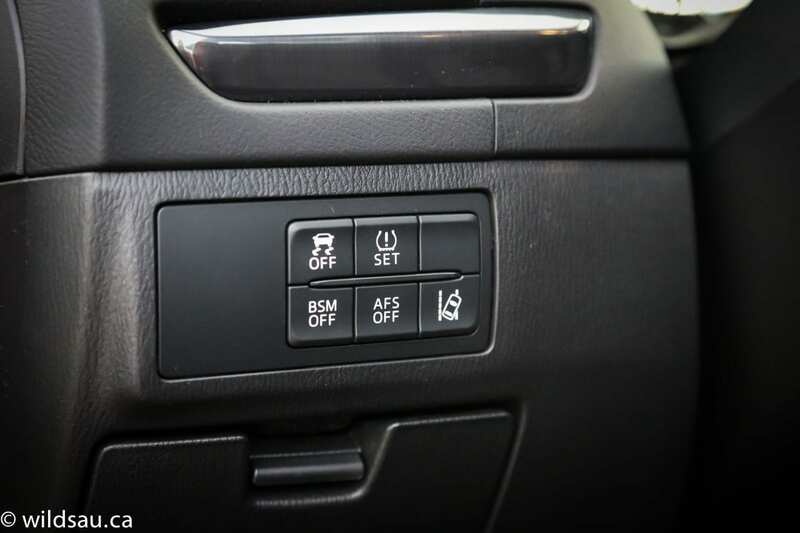 The center console is home to the gear selector, a traditional parking brake, two cupholders and the HMI Commander Switch. 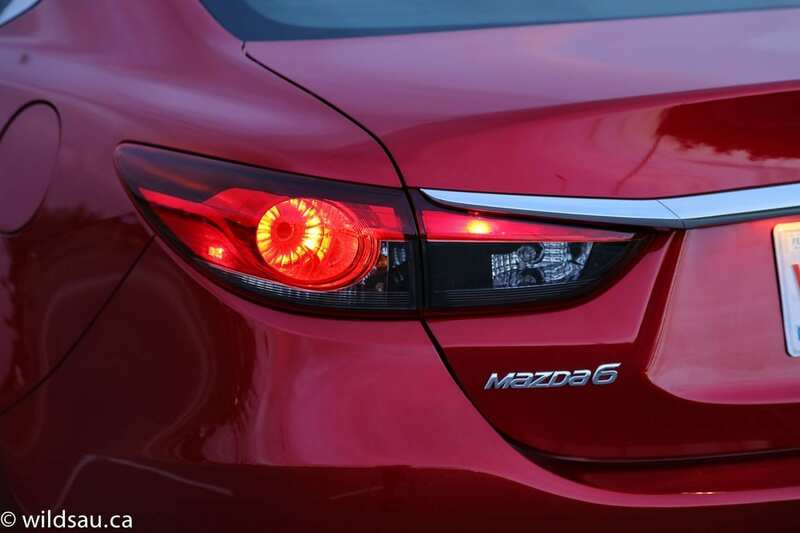 HMI is Mazda’s user interface for the screen, and stands for Human Machine Interface. It’s a joystick, rotary knob and button combination, along with some hard buttons to access main functions. It works fine and reminded me of Mercedes’ COMAND system in terms of how it navigates around the screen. There’s also an armrest with an adjustable lid. Overhead you’ll find a Homelink universal garage door opener and an average-sized power tilt/slide sunroof. Driver assistance tech was plentiful in this review car. Try to keep up: you get Forward Obstruction Warning, Smart City Brake Support (which moves the brake pads close to the disc when it senses a vehicle ahead of you), Blind-Spot Monitoring System, Radar Cruise Control, Lane Departure Warning System, Rear Cross Traffic Alert and of course a backup camera. As is typical, the middle seat is not so great – there’s a tunnel on the floor destroying the foot room and the seat is narrow and raised. 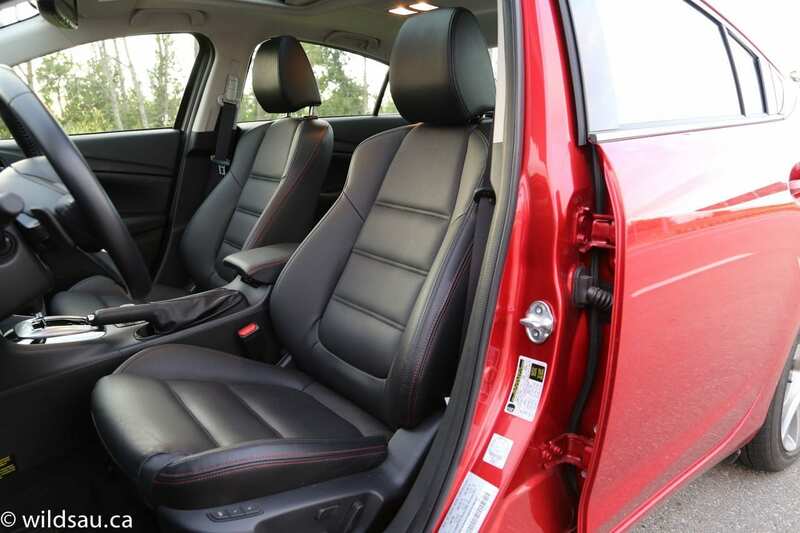 In terms of comfort and convenience, there are two seatback map pockets and bottle holders in the doors and the middle seatback folds down to become an armrest with two cupholders. There are adjustable air vents at the back of the center console but nothing else – I’d wish for a 12V or a 120V household plug. Our three kids were very comfortable back there,and you’re provided with two sets of LATCH connectors for their seats. You get a decent glove box and a nice rubberized drop-in tray under the center stack – it’s great for smart phones or any quick access items you want to drop in there – there’s a 12V plug in there as well. Interestingly, the 6 has no door bins – just bottle holders. There’ also a small carpeted bin under the armrest lid – you’ll find the USB, aux and (another) 12V plug inside. I found the trunk to be reasonably sized and easily accessible. 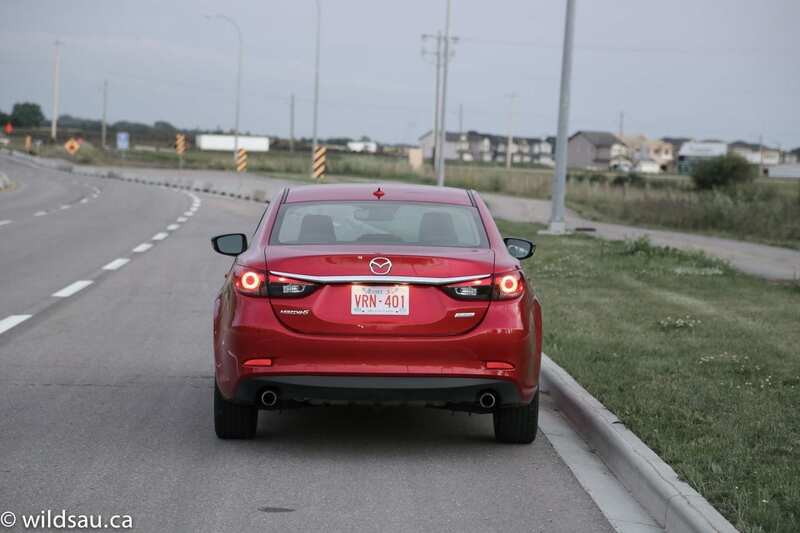 There are shallow storage trays on either side of the trunk, and the trunk lid’s arms are shrouded so you won’t be having them swing down to pinch your cargo. 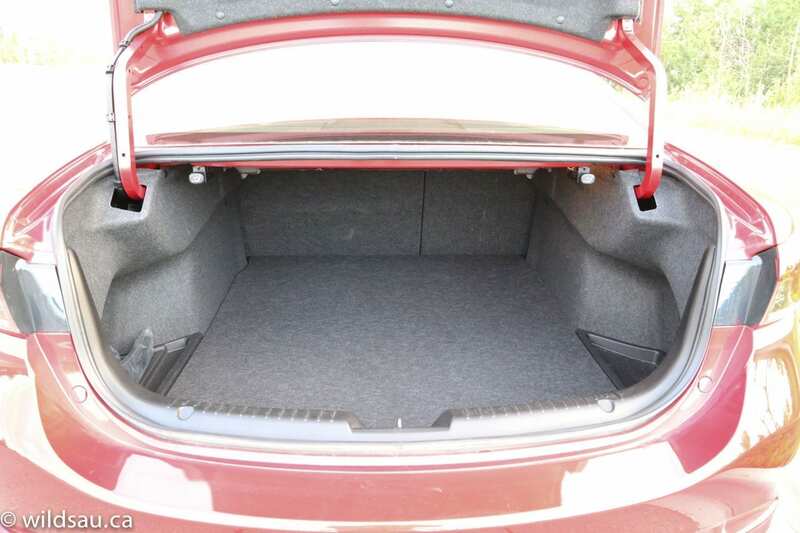 You get 419 litres of trunk space – the rear seats can be split 60/40 and folded down if you need more. 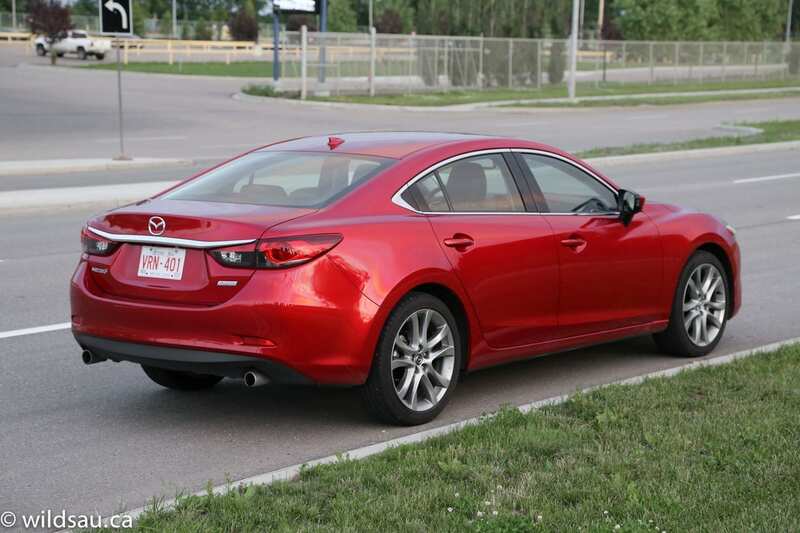 My first impression of the Mazda6 wasn’t great. Because I needed to get somewhere in a hurry and was a bit miffed at how weak it felt. And that put me off for a bit. Luckily I had a week to re-evaluate my impression. It turns out that basically any time you put the hammer down, you don’t really need to. But yes, any of those unnecessary moves where you want to launch it off the line or blow by someone on the freeway, the 6 feels a bit weak-kneed. But let me be clear – it was plenty of power – plenty for everyday driving. 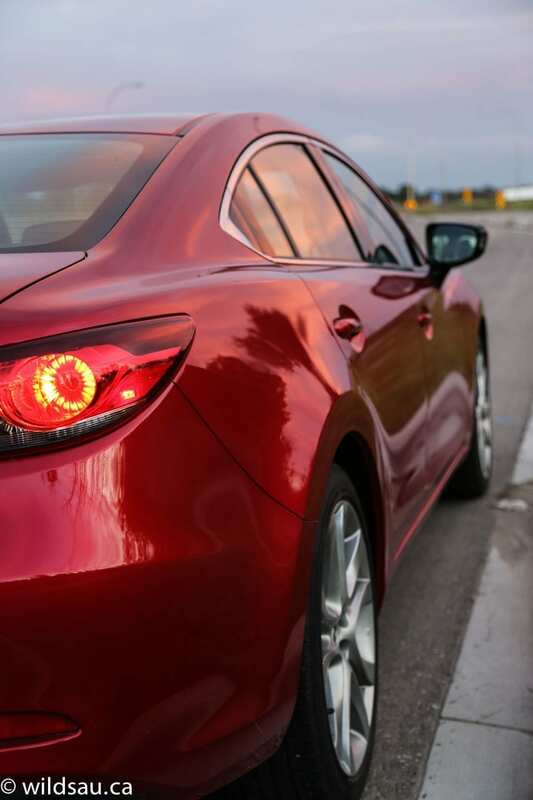 It moves smartly off the line, and even passing on the freeway or highway is just fine if you can accept that it will happen at a reasonable rate of speed. No, you won’t slingshot ahead. Yes, you will do just fine. Now let’s get into the great stuff. 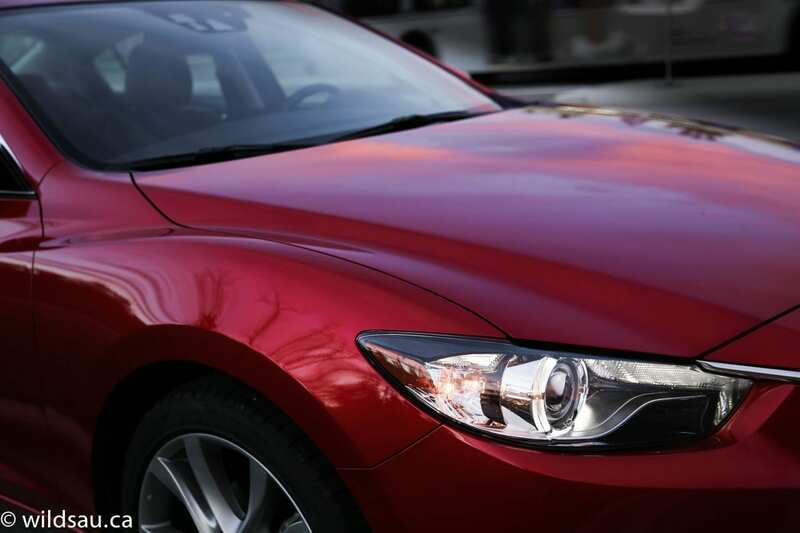 The 6’s ride is very well done – it’s firm, but always remains comfortable. Because it’s firm, it always feels well-controlled, even sorting out bumps and dips around corners and curves. And it is fantastic on the highway. Even better than the ride is the handling. 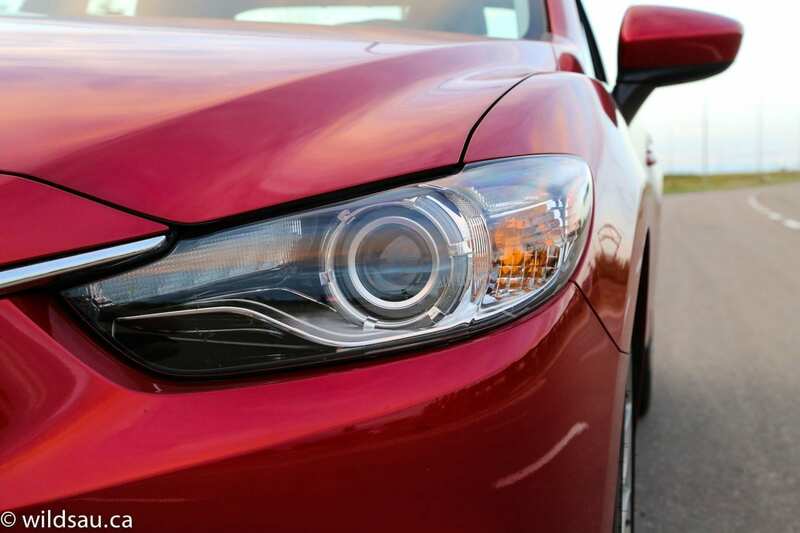 It’s simply not what you expect from a mid-size sedan. I found it to be very dynamic, and its stance on the road is nearly flawless. Add in an incredibly responsive steering system and you’ve got a winner. Throw it into a curve gently, and it stays flat and true. Take a corner hard, and the 6 never falters – as a matter of fact, it rotates around a point, rather than plowing into understeer the way you expect a front-driver to do, and I say this with confidence – I always felt like the 6 was inviting me to play. Not only is the suspension properly sorted, the car’s relatively light weight plays a big role in making things feel tossable. It’s a fun car to drive! The automatic transmission seems very intelligent. It was always smooth and didn’t hesitate to stay in a gear longer if it felt my driving style required it. I appreciated the decent kickdown time when you push it. 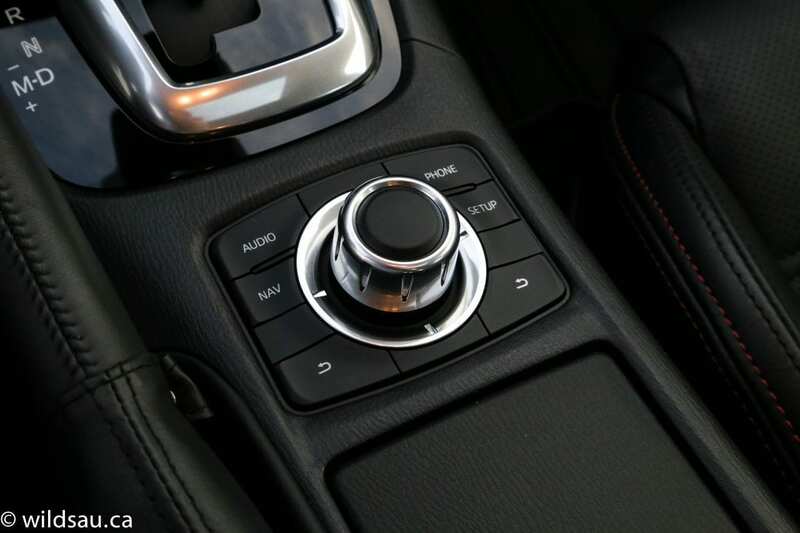 It can be shifted manually using paddles or the gear selector itself, and although the shifts aren’t as crisp as a dual-clutch can be, they felt quite quick for a conventional automatic. It’s interesting that Mazda sells this as a “Sport” mode transmission, considering there is no aggressive sport mode you can put it into. Also, this car is available with a 6-speed manual transmission. To sum up the drive, I really liked that the 6 requires more effort (in a good way) and feels sportier in almost every situation, yet is very easy to drive. Visibility out of the car is very good from every angle, and the brakes are powerful and easy to modulate. I found that some of the angles scuplted into the dash are very reflective onto the windshield and were quite distracting on sunny days. 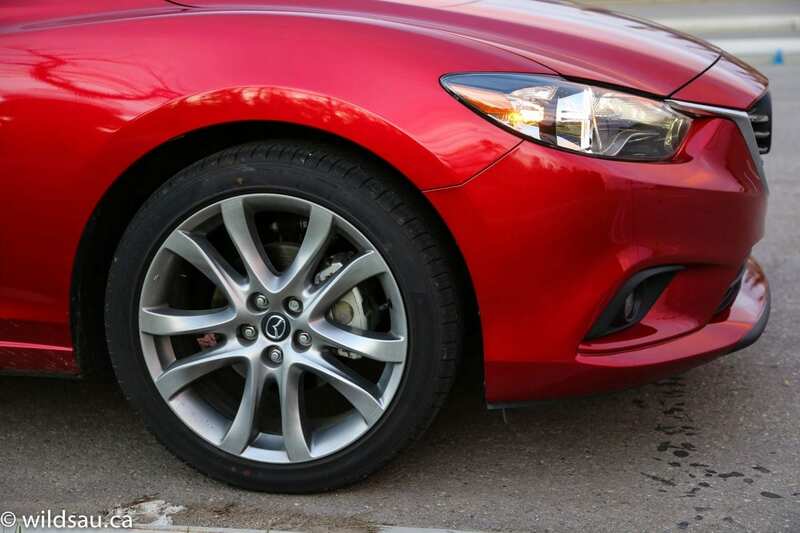 Thank you, Mazda, for putting a great, effective dead pedal in this car. A simple but oft overlooked feature that I appreciate very much! 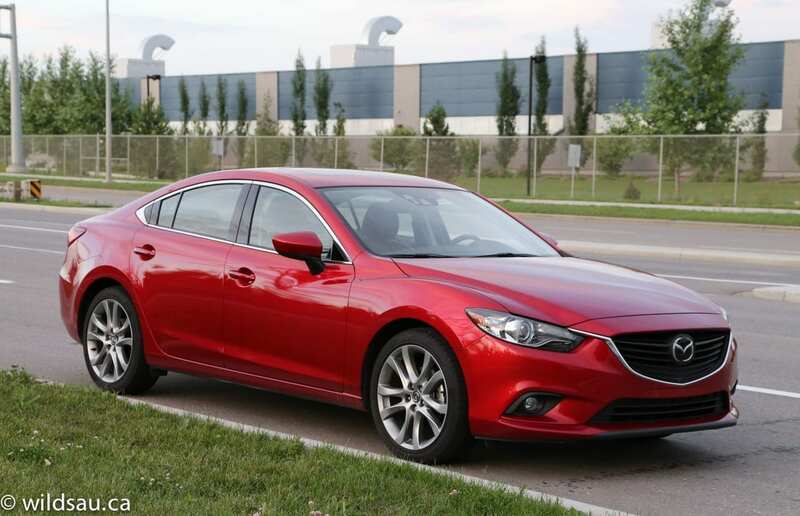 If you couldn’t tell, the Mazda6 is one of the most fun 4-door sedans I’ve driven. I completely forgot about the “lack” of power as the week progressed and immersed myself into a totally enjoyable driving experience. I couldn’t wait to get back into it every time, and it is definitely a driver’s kind of car. Great driving performance, excellent build quality and outstanding fuel economy. A pretty solid combination. 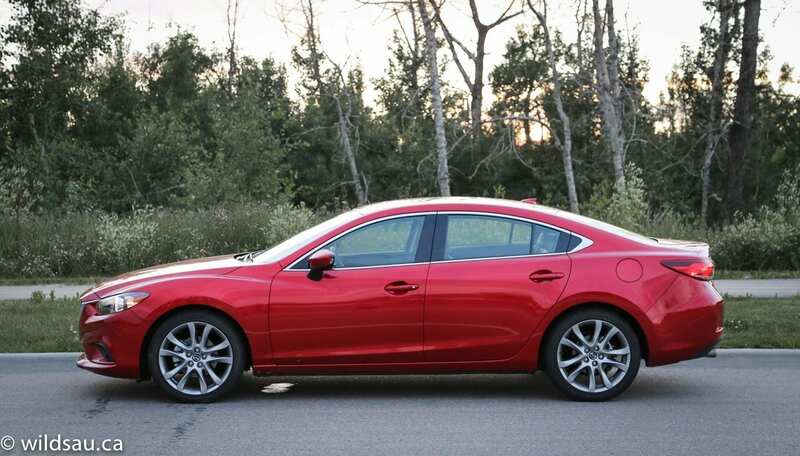 I give the 2014 Mazda6 an 8 out of 10. WAF (Wife Acceptance Factor) was quite high. She absolutely loved the exterior styling, and thought the interior was “nice”. She’s more of a hatchback/lift gate kind of girl, because she relies heavily on retail therapy, but otherwise she was impressed. We’re lucky as consumers, because this class has sure picked it up a notch. 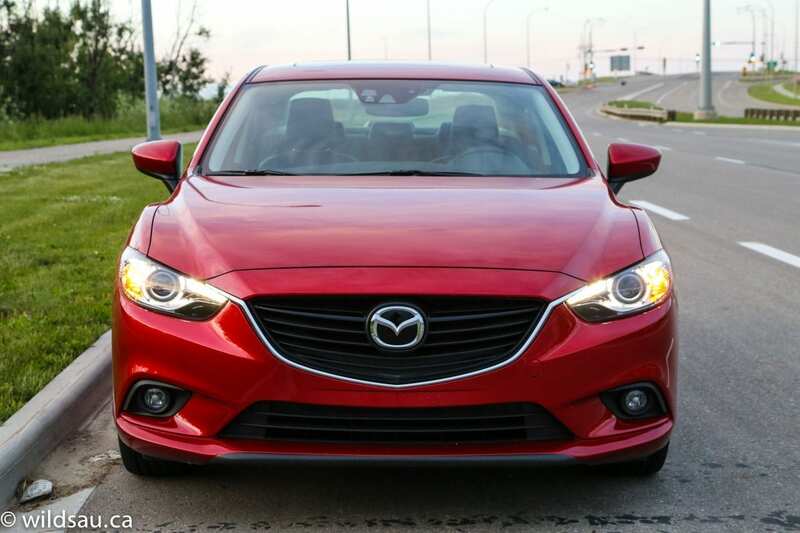 As great as the Mazda6 is, many of the competitors (such as the Honda Accord and the VW Passat) have really upped their game too. 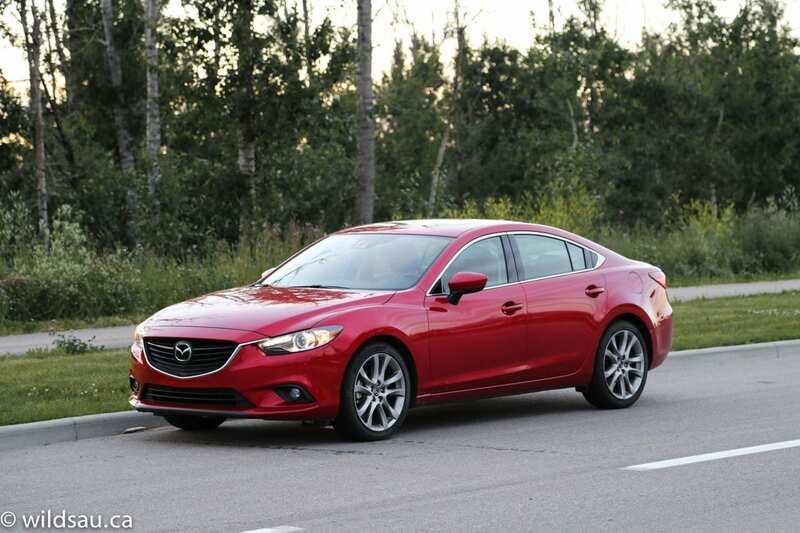 A great time to be in the market for one of them, and I wouldn’t hesitate recommending the Mazda6. I was very impressed.